Citation: Ann. Gen. Sci. Phys., 3: p. 54, pl. 35. Distribution: Angola, Botswana, Cameroun, Central African Republic, Chad, Côte d’Ivoire (? ), Ethiopia, Gambia (? ), Guinea, Kenya, Malawi, Mali, Moçambique, Namibia, Sénégal, Somalia, South Africa, Sudan, Tanzania, Uganda, Zambia, Zimbabwe. Recently extinct: Algeria (? ), Benin, Burkina Faso (? ), Burundi, Dem. Rep. Congo (? ), Eritrea, Gabon, Ghana, Niger, Mauritania, Nigeria, Republic of Congo, Rwanda, Sierra Leone, Togo (Fanshawe et al, 1997). 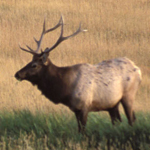 Status: U. S. ESA – Endangered; IUCN – Endangered. Comments: Allocated according to G. M. Allen (1939) and Ellerman et al. (1953). Girman et al. (1993) presented molecular evidence concerning subspecies.